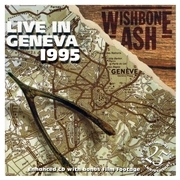 On April 6 1995 WISHBONE ASH played the Rock Heroes Festival in Geneva. Their performance was captured for posterity and is now re-released with a Flash Player track of opener “The King Will Come”. When ubiquitous guitarist/vocalist Andy Powell greeted the audience with “… We´re of cause WISHBONE ASH…” it has a doubtful ring to it. The original band was gone as original vocalist/bass player Martin Turner upped and left in 1991, drummer Steve Upton left both the band and the music business while Ted Turner lasted a live album longer that the two aforementioned. So in time for the 25th anniversary Andy met with a manager, Martin Looby, who in turn secured the band a spot on a rock festival in Geneva. And in High Definition it was… Not wasting any time Andy recruited rising guitar star Roger Filgate, bassist Tony Kishman of BEATLEMANIA fame and drummer Mike Sturgis (ex. SCOTT GORHAM´s 21 GUNS, ex. ADRIAN SMITH´s Psycho MOTEL and ASIA. Before you start arguing about the band give them a chance. Andy might have been the sole remaining original, but their performance is solid and tight. Opener “The King Will Come”, the compelling third reunion title track “Strange Affair”, the ever interesting lyrics of “Hard Times”, the sweet “Keeper of the Light” oral exercise “Vas Dis” are all fabulous renditions. This disc is highly entertaining and well-executed. This said without any hard feelings towards any past or present member of this long-running concern.